Pipe replacement or whole-house repiping in Orlando, FL is a large, but necessary task when your home meets the criteria for it. We understand that this can seem scary, however, a plumber will only suggest repiping when it is absolutely necessary. 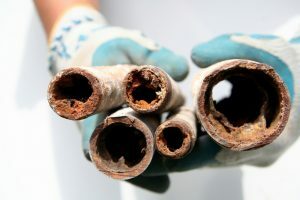 At some point, your plumbing system will age to the extent that replacing or repairing just one section of the piping isn’t going to be an effective means of solving the problem. Whole house repiping is both the safest and most efficient way to protect your home from leaks and water damage when your plumbing system has aged beyond its limit. Many homeowners are not aware of signs that suggest their home needs repiping services, so today we have outlined them for you below. Of course, only a trained plumber will be able to determine whether or not repiping is the best choice for your home. Keep reading to learn more. Up until the 1960s, plumbers were using galvanized steel for pipe installation. Although built to last, these pipes are prone to corrosion over time (the average lifespan being about 40-50 years). If you live in a home with a steel plumbing system, you are quite overdue for an upgrade. Today’s plumbing systems are comprised of either copper or plastic piping, which is longer lasting and does not experience the same problems as steel pipes do. Copper or plastic pipes are not prone to rust, corrosion, and the absorption of contaminants, like lead. An occasional leak in your plumbing system is not necessarily a cause for concern. However, you should begin to worry about the quality of your piping if you start to experience frequent leaks. If you’ve had to repair numerous leaks throughout the years, in different locations of your home, it could mean that your plumbing system is failing. Repiping might be a better option for your home and wallet. Rather than paying for costly repairs and single pipe replacement, it is better to invest in a new system that is going to be less problematic and more effective. If in the last few months, or even years, you’ve noticed brown or yellow water, or water with particles of sediment in it, you likely have a serious plumbing issue on your hands. This discoloration is often a sign that your pipes are corroding, allowing sediment and rust to seep into the water supply. Sediment and rust, though not inherently dangerous, can significantly impact the quality of your water, impacting both taste and smell. As we mentioned above, whole-house piping should only be done when it is absolutely necessary. An experienced plumber will be able to determine whether or not this service is right for your home. Our dedicated team here at Modern Plumbing Industries, Inc. offers pipe replacement and whole-house repiping services to customers throughout the Orlando area. Should you decide to replace your pipes after consulting with one of our plumbers, we can go over the different piping material we offer to find the solution that best fits your needs and budget. To learn more about whole-house repiping, contact Modern Plumbing Industries, Inc.